TV BANTER . . . with Joanne Madden: David Hasselhoff: The Life and Times of "The Hoff"
David Hasselhoff: The Life and Times of "The Hoff"
I think that without sushi there would be no David Hasselhoff, because sushi is like the perfect way of describing the insides of David Hasselhoff. He is like protein, clean and easy. That's how I feel about myself. Who but the man nicknamed "The Hoff" would compare himself to sushi? 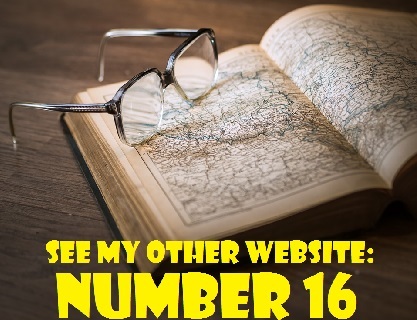 He's quite a character, that David Hasselhoff, and he's had quite a career. He's been the star of two hit television series and has enjoyed recognition as an international singing sensation. David Michael Hasselhoff was born in Baltimore, Maryland on July 17, 1952. His mother, Dolores Therese Hasselfoff (died February 11, 2009) was a homemaker and his father, Joseph Vincent "Joe" Hasselfoff, (died November 16, 2014) was a business executive. David is of German, English and Irish descent. He is the second oldest of five siblings and the only male. His four sisters are Daine Hasselfoff (born May 19, 1950), Jean Hasselhoff (born March 7, 1956), Joyce Hasselhoff (born July 1, 1954) and Lisa Hasselhoff (born July 5, 1968). Due to their father's work, the family had to move frequently. David became interested in acting at a young age. At seven, he made his theatrical debut in a production of Peter Pan. He later attended the Academy of Dramatic Arts in Pontiac Michigan and the California Institute of the Arts in Valencia, California. After graduating from the California Institute of Arts with a degree in theatre in 1973, he thought he was headed for a career on Broadway. Unexpectedly, his career went in another direction and he ended up starring in a popular soap opera. 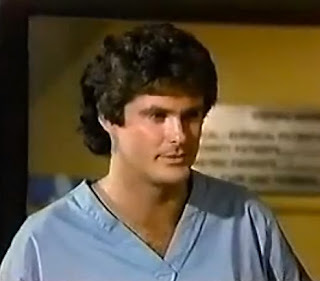 Hasselhoff first came to prominence in the role of Dr. William "Snapper" Foster on the CBS daytime drama The Young and the Restless. 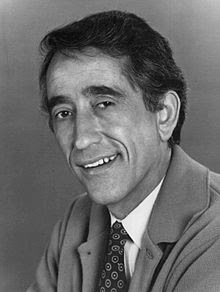 He appeared on the soap from 1975 until 1982. When David left the show, Snapper and his wife, Chris (Trish Stewart) moved to London, England and were written out of the storyline. Brandon Tartikoff, president of NBC at the time, recruited the young actor to star in the science fiction series Knight Rider. 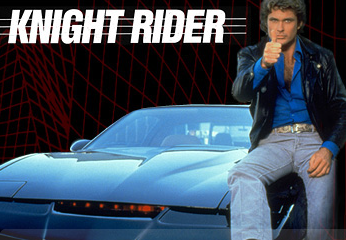 Knight Rider proved to be a huge hit and David's move from daytime to primetime was a tremendous success. From 1982 to 1986, he portrayed Michael Knight, the lead chracter on the show. The role earned him a People's Choice Award and a large following overseas. Knight Rider chronicled the story of how billionaire Wilton Knight rescued a Las Vegas undercover police detective, Michael Arthur Long, and gave him a fresh mission in life. After being shot in the face and undergoing plastic surgery, Long was provided with a new face, a new identity and a new name. Calling himself "Michael Knight," he transformed himself into a high-tech crime fighter for Wilton's public justice organization, the Foundation for Law and Government (FLAG). To combat crime, Michael utilized Knight Industries' magnificent super-car, Knight Industries Two Thousand or KITT, for short. KITT was a sleek, black customized Pontiac Trans-Am. It contained weaponry such as smoke bombs and flame throwers. Controlled by a commuter with artificial intelligence, this incredible automobile could speak and had its own personality (Veteran American actor William Daniels provided the voice of KITT). Whenever Michael was in danger, he summoned the car and it would crash through walls to save him. 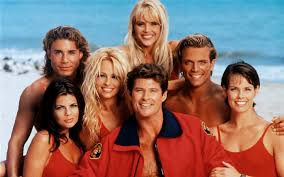 Baywatch, David's second hit series, made its debut on NBC in 1989. The drama, about lifeguards on the beaches of Los Angeles County, California, was cancelled after one season due to low ratings and because its production company, GTG Entertanment, went out of business. However, David and the show's creator and executive producers wanted to keep the series alive. In 1991, they brought it back for the first-run syndication market and Hasselhoff took over as the show's executive producer. Although definitely not high-level drama, the series developed a following and turned out to be wildly successful with both American audiences and international viewers. David Hasselhoff, who portrayed Mitch Buchannon, the lieutenant in charge of L.A. County lifeguards at Malibu Beach, became one of the most recognizable television actors in the world. The show also featured Yasmine Bleeth, Carmen Electra and Pamela Anderson and it was known for its distinctive red swimsuits. As Hasselhoff pointed out, "We made sure nobody ever drowned on Baywatch." Baywatch's locale was eventually moved from Southern California to the South Pacific. Due to high production costs in Los Angeles, Baywatch was filmed in Hawaii for two seasons, from 1999 until 2001. Accordingly, the name of the the series was changed to Baywatch Hawaii, much to the benefit of the Aloha State. According to a January 9, 2000 article in Pacific Business Review, the show was a boon to the local economy, pumping millions into the Hawaiian tourism and business industries - 22 episodes in 1999 (at a cost of $800,000 per episode), each earned an estimated $17.6 million. 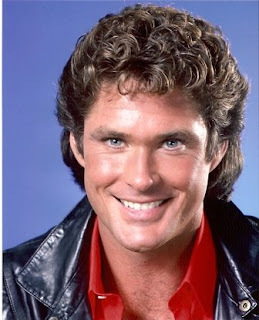 In the late 1980s, David Hasselhoff launched a successful music career in Europe. 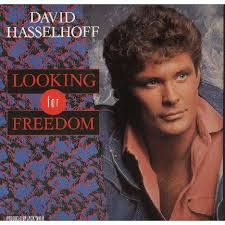 In 1989, "Looking for Freedom" remained in the number one spot on the German pop charts for eight consecutive weeks and many regarded it as an anthem for the peaceful revolution that led to the reunification of East and West Germany. That same year, in a memorable New Year's Eve concert soon after the opening of the Berlin Wall, David belted the song out on both sides of the structure. In a November 9, 2014 article for National Public Radio (NPR), David talked about the experience. "I had been behind the Wall eight or nine times since 1987, to kind of further my music career with the Knight Rider car; if they wouldn't come and see me, they would come and see the car," he remarked. "I hit big with a single and they invited me to sing, and I said, 'Only if I could sing on the Wall.' And they said yes!" 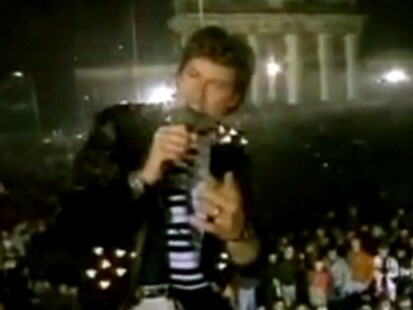 Officials from both East and West Germany made Hasselhoff the focus of the New Year's celebrations. Wearing a remarkable flashing jacket with battery-powered lights, he sat atop the Berlin Wall, the Brandenburg Gate behind him, and sang to the massive crowd. David later stated that people told him that "Looking for Freedom" was more than a mere pop song. He said it became "our song of hope." The actor/singer visited Berlin often during the ensuing years, most notably in 2013. He returned to the German capital in March of that year as part of his campaign to preserve the final fragments of the wall he helped to bring down. The Wall's surviving stretch was under threat from property developers who wanted to tear down part of the historic monument to allow access to luxury apartments. David has been married twice and both marriages ended in divorce. He wed actress Catherine Hickland on March 24, 1984. The marriage lasted until 1989. On December 5, 1989, he married another actress, Pamela Bach. The couple had two daughters: Taylor-Ann Hasselhoff (born May 5, 1990 ) and Hayley Hasselhoff (born August 28, 1992). David's breakup with Pamela became very bitter and nasty. In January of 2006, he announced that he would be filing for divorce due to irreconcilable differences. In March of 2006, Pamela accused him of violent behaviour. Hasselhoff denied the allegations through a statement from his publicist. Both David and Pamela have since been involved in separate alcohol-related incidents. David has publicly admitted that he has received treatment for alcoholism. On May 3, 2007. an embarrassing video surfaced in which he is apparently in a drunken stupor. In the video, he appears shirtless, attempting to eat a cheeseburger in a Las Vegas hotel room. His daughter Taylor-Ann's voice can be heard in the background urging him to tell her when he was going to stop. She warns her father that this could cost him his role in the Las Vegas production of The Producers. In response to the leaked video, Hasselhoff put forth a statement declaring that Taylor-Ann deliberately recorded and released the footage so that he could witness his behaviour while intoxicated. On May 3, 2009, David was rushed to hospital, allegedly due to alcohol poisoning, according to a report on Radar Online. His representatives denied that he was hospitalized for that reason. In September of that same year, Fox News Channel reported that he had been once again hospitalized for alcohol-related reasons. The allegation was again denied by his representatives. In November of 2009, according to Radar Online, David was rushed to hospital after suffering a seizure. In May of 2010, he was again reportedly rushed to the hospital following a drinking binge, accompanied by his daughter Hayley. In November of 2009, Pamela Bach was arrested by California Highway Patrol and charged with driving under the influence. She was sentenced to jail time after pleading no contest to the DUI charge. She was given an extra 60 days in prison due to a previous DUI charge Her driver's licence was suspended for two years and was fined $2,100. * David Hasselhoff has written an autobiography titled Making Waves. It was released in the United Kingdom in September of 2006. * David's younger sister, Jean Hasselhoff, is also an actress and singer. She has appeared in minor roles in soap operas including General Hospital, Santa Barbara and The Young and the Restless. Her film credits include The Seduction (1982), Hell Night (1981), Baywatch : Guys & Dolls (1994) and Knight Rider: Dead of Knight (1984). She has also appeared in TV commercials. Jean married Douglas Driver in 1988. The couple had two children and settled in Nevada. * In 2006, David Hasselhoff became a co-judge on NBC's amateur talent show, America's Got Talent. He remained with the show for four seasons. In 2010, however, the network failed to renew his contract in and he was replaced by comedian Howie Mandel. According to the U.K.'s Daily Mail, there were claims that "his drinking had made his position untenable," but David stated that he left America's Got Talent to follow his "dream" of doing his own TV show. Soon after his departure from America's Got Talent, David and his two daughters starred in an A&E reality show called The Hasselhoffs. The series premiered on December 5, 2010. It focused on David's efforts to revive his career and to establish his daughters, Hayley and Taylor-Ann, as a presence in Hollywood. * In June of 2010, David briefly reprised his role as Dr. Snapper Foster on the Young and Restless in a storyline dealing with the death of his character's mother, Liz Foster. In September of 2010, he appeared as a contestant on the 11th season of Dancing with the Stars. along with his professional partner Kym Johnson. He and Johnson were the first to be eliminated from the competition and he later told Good Morning America that he was not surprised. He said, "Going into this I kinda knew I wasn't going to be the judges' favourite. All I wanted to do was have fun." 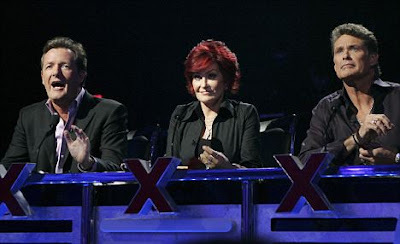 * In 2011, Hasselhoff became a member of the judging panel of Britain's Got Talent. However, he was dropped after only one series on the show. * In 2015, Hasselhoff released a single, "True Survivor," along with a video, Recorded in Sweden and featured in the Swedish martial arts short film comedy Kung Fury, the song and video are designed as both a parody of the 1980s and a tribute to that decade. EDITOR'S UPDATE (May 5, 2016): On May 3, 2016, Hello! 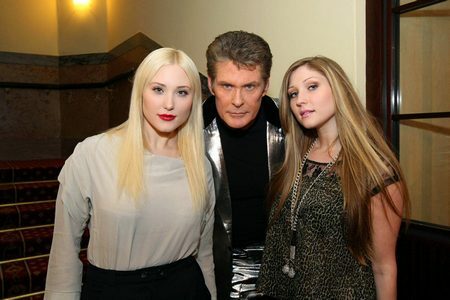 Magazine reported that David Hasselhoff, 63, had become engaged to his longtime girlfriend, Welsh model Hayley Roberts. David met Hayley, 36, during his stint on Britain's Got Talent. According to Hello!, David proposed to Haley during a picnic lunch in Malibu, California. hi once again just wanted to thank Joanne for an wonderful and amazing article about the very handsome and talented David Hasselhoff big-time I was a true fan of his for yrs and he was an amazing guy to boot even though he had some problems along the way but he was a great singer and actor to boot and god bless him to and his family too and god bless KITT too that amazing wonderful car too knight rider lives and Baywatch too thanks Joanne m for this too u are awesome gal amen! sincerely Anne-Marie m. gething your longtime tv banter reader and supporter too amen!